James Armstrong was in business in Brooklyn in the mid-1850s, first with his father, Thomas S. Armstrong, and later from 1859 through 1877 in a partnership with Joseph J. Blacklin (1820?-1883) as Armstrong & Blacklin. This ad from 1859 shows Armstrong & Blacklin as plumbers at 278 Court St., Brooklyn. This ad from 1868 shows Armstrong & Blacklin as plumbers and gas fitters at 273 Court St., Brooklyn. Two years later they were Armstrong & Blacklin with two locations, 213 Fulton St. and Court St. corner of Union St. This ad from the Real Estate Record and Builders' Guide, 1879, shows that Armstrong was now in business on his own at the Court St. address as well as a branch on Myrtle Ave. This one from 1881 shows 348 Court St. and two other Brooklyn locations. Armstrong had several locations because he sold fixtures to the public in addition to his work with plumbing installation and repair. 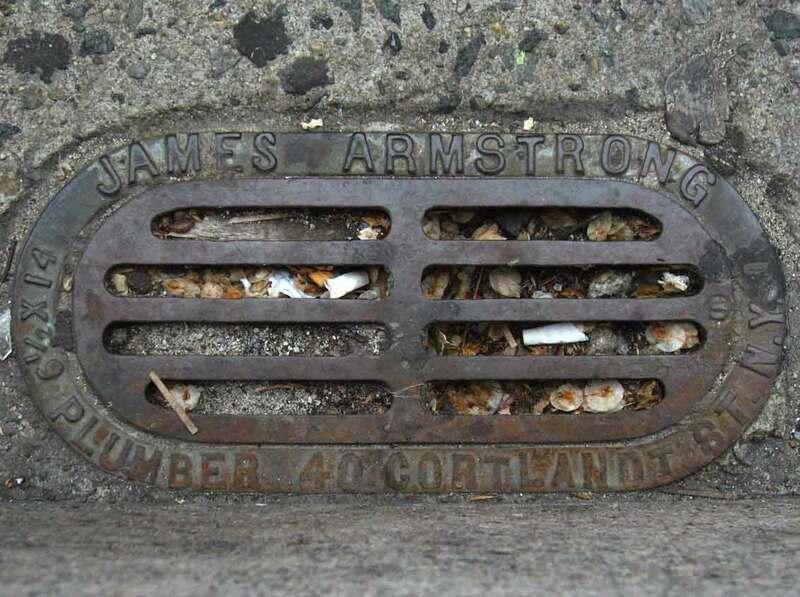 In 1888 "James Armstrong, fixtures" appeared in Trow's New York City Directory, located at 40 Cortlandt St., New York. And this ad appeared in a publication entitled Grocerdom: A History of the New York and Brooklyn Grocers' Associations, in 1892. This shows the 40 Cortlandt St. address in New York and the Court St. address in Brooklyn. James Armstrong (1832-1905) himself appeared in the 1900 U. S. Census, age 67, living at 249 President St., Brooklyn. The census recorded him as a naturalized citizen born August, 1832, in Scotland, who immigrated in 1835. Living with him in 1900 were his wife, Frances, born Canada, two daughters, Emma R. and Fanny I., and three sons, Charles A., Edward T. and Frederick A. Charles and Edward were twins, born August, 1869. The children were all born in New York. In 1905 notice of James Armstrong's death appeared in the Brooklyn Daily Eagle, 13 March 1905, pg. 20, "Died Armstrong.- On Sunday evening, March 12, 1905, at his residence, 249 President st., Brooklyn, James Armstrong, in his 73d year. Funeral services on Wednesday, March 15, at 2:30 P.M. at his late residence. Interment private." In 1914 notice of Frances Armstrong's death appeared in the New York Times, 22 January 1914, pg. 11, "Died Armstrong.- On Jan. 19, 1914, Frances Victoria, widow of the late James Armstrong, aged 76 years. Funeral services at her late residence, 249 President St., Brooklyn, Thursday, at 2 P.M. Friends kindly omit flowers." Three of James Armstrong's sons continued the business after their father's death. These were James Armstrong, Jr. (1862-1930), Charles A. Armstrong (1869-1957), and Edward Thomas Armstrong (1869-1941). James Armstrong, Plumbers, were in business in New York City well over 100 years. They are first mentioned in Brooklyn city directories in the early 1860s and stayed in business until 1968. In Manhattan they were located at 40 Cortlandt St. from 1888 to 1900, then 52 Dey St. (1900-1908), 219 E. 38th St. (1908-1939), and 657 2nd Ave. (1940-1968).